Throughout countless hours in the woods, I’ve learned a few basic principals for staying safe and comfortable. Each mistake is a lesson learned, and every outing comes with a new lesson. I’ve learned these lessons the hard way, but you don’t have to. Below are what I consider the most important hiking preparation advice. This may seem like it should rank low in importance, especially if you fancy yourself a no-frills adventurer who can overcome obstacles with teeth gritting. Unfortunately, that little strap rubbing against your shoulder and that tiny pebble in your shoe is enough to bring down Paul Bunyan himself after a couple of hours. Quadruple the degree of discomfort you feel when you start off on a hike and you’ll have an idea of what it’s going to feel like further down the trail. When you stop for your first break you will be surprised how small discomforts have suddenly morphed into handicapping pain. Before you begin, it’s a good idea to have everything adjusted. Even if it means holding up your companions, spending time getting everything adjusted at the outset always pays off by not getting held up making repeated gear adjustments further down the trail. Make sure your socks don’t have an annoying wrinkle in them, tighten up your laces and double knot them, perfectly adjust your backpack, and eliminate anything that may cause blisters and chafing. Bringing that massive beach cooler seems like a great idea when you picture yourself living the good life at your destination. The mental and physical battle endured getting it there can quickly outweigh any benefits. A heavy pack is never worth a twisted ankle. A twisted ankle can quickly turn into a survival situation when you’re far into the wilderness. When you pack for your excursion, always start with the most important items and work your way down (Water >Food >Warmth>…Bottle of wine). Every ounce counts when it comes to hiking, so even the smallest item warrants careful consideration. Experienced hikers will often weigh their gear by the gram. It’s the reason that “ultralight” gear can be significantly more expensive than cheaper, heavier counterparts. Pack your heaviest items low in your pack to ease pressure on your shoulders and always have water easily accessible. It doesn’t matter what season it is, layering is extremely important. Knowing the basic fundamentals of layering is essential, and must be considered for every part of your body. Being soaked with sweat is always your enemy, and being too hot or too cold can be life-threatening. The same basics apply to each body part. The base layer should be thin, light and moisture wicking, followed by a thicker insulating layer such as wool, and topped by a wind breaking/water repelling shell layer (choosing light colours for your outer layers can help you identify and remove dark-coloured ticks). Layering is important because it allows you to adjust to your changing body temperature and environmental conditions by dawning or shedding layers as you go. Be aware that your body temperature will rise drastically once you start moving. It’s wise to start with minimal layers and add them when you stop moving. Sweaty clothing is your enemy in cold weather especially. Whatever the conditions when you start out, it’s no guarantee they will stay that way. Dense forest can shield the wind, rain and sun, so when you get to an open area you’re exposed to a massive change in conditions. Coastal areas are also notorious for dramatic changes. Temperatures can rise and fall one season’s worth at any given time. When you stop moving, a stiff breeze can make summer feel like winter. Hard, physical exertion can make winter feel like mid-summer heat. If you aren’t careful to adjust your layers accordingly, you can quickly encounter dangerous hypothermia or hyperthermia situations. The most important part of your body in the outdoors is your feet. Taking proper care of your feet should be your #1 priority. If your feet hurt, you can’t move, and if you can’t move you’re in trouble. Most important of all is having dry feet. Wearing a sock liner is a good way of keeping your feet dry and blister free. Make sure your footwear is comfortable and will not cause any blisters or other discomforts which can hobble you after a few hours of hiking. “Waterproof” and “breathable” are two keywords to look for with footwear or most types of equipment for hiking. 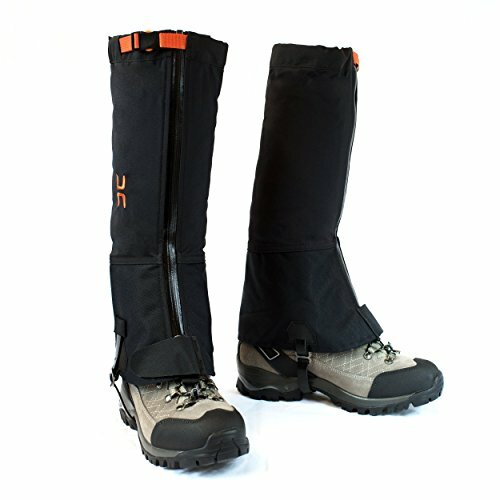 Top things off with a set of gaiters, and you can have lightweight protection for your shins while keeping twigs, insects, and moisture out of your boots. Foot warmth is really only a concern in winter. Wool socks over your sock liner, combined with waterproof boots are usually enough to do the job. During other seasons you don’t want to insulate too much. Sweat and wetness is more often a problem than warmth is. You can survive weeks without food but only a couple of days or hours without water. You should never overlook bringing water even on a short outing. Water is always #1 on my packing list for any trip. Many hiking backpacks now have dedicated space for a hydration pack, which is often the most convenient way of carrying water. On longer trips where bringing a heavy supply of cumbersome water jugs isn’t practical, consider water filtration devices, purifying tablets, or good old fashioned boiling to make use of available water sources. You should also be attuned to recognize the symptoms of dehydration and not to let yourself reach even the earliest stages. Note: I highly recommend having a first aid kit, compass, emergency blanket and firestarter. Regardless of the time of year or length of hike, those items will always be in my pack.